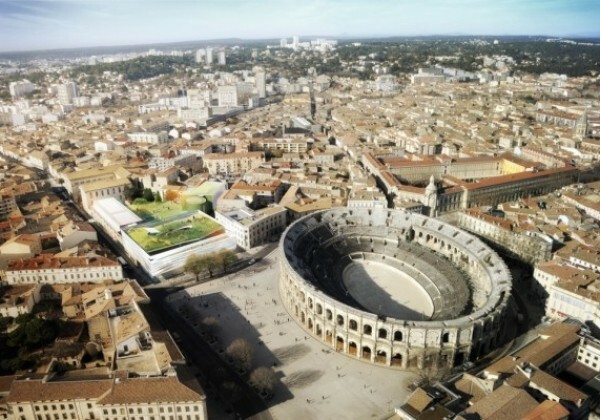 On this exceptional site, facing the Roman arenas and amphitheater of Nîmes, crossed by the ruins and the archeological remains of the ancient Roman fortifications, the main challenge for this project was to design a museum that would become a reference on an international scale. The Musée de la Romanité creates a strong architectural dialogue between two architectures separated by over two thousand years of history and facing each other. The project is located on the backbone of the site, on the old limit that used to separate the medieval town from the modern city. On these remains, twenty centuries of urban strata and architecture are overlaid: this is the exceptional heritage of the city of Nîmes. 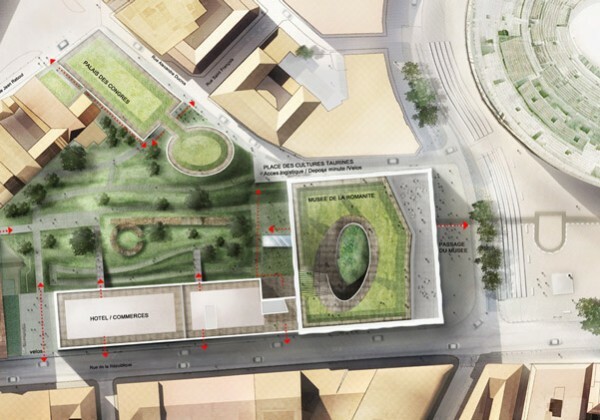 The scale of this project led us to gather multiple skills : the specifications included not only the creation of the museum but also the urban regeneration of the “Grill” plot, the museography, the archaeological garden landscaping and a feasibility study of a congress centre and a hotel. “The explicit requirement in this competition was to create a museum that would be a contemporary response to the Roman Arenas. 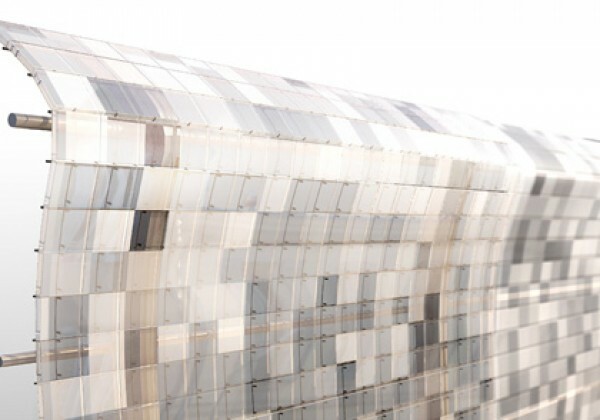 I took a long time to analyze the Arenas and asked myself about the notion of a contemporary building. It appeared clearly to me that the dialogue between these two architectures would be based on opposition, difference. On one side a round volume, encircled and bind by the verticality of the roman arcs, made of stone and deeply anchored into the ground, on the other side a great square volume, floating into space and entirely draped by a pleated glass robe. 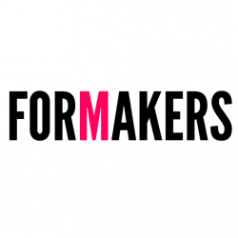 ” ￼￼￼￼￼￼￼￼￼￼￼￼￼￼￼Elizabeth de Portzamparc Elizabeth de Portzamparc’s proposal is based on a dialogue made of opposition and complementarity. 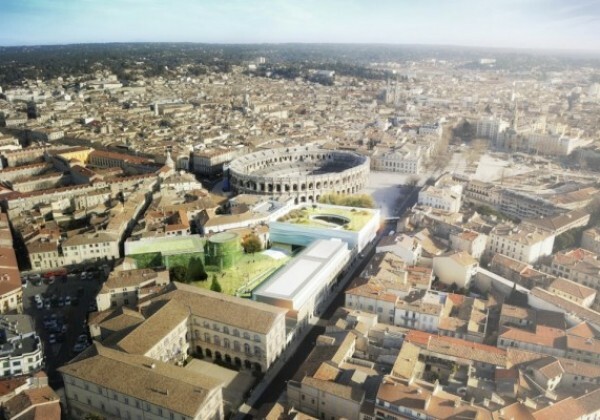 In spite of their differences, the twenty centuries of History separating the museum and the antique Arenas of Nîmes require the creation of a dialogue. Two geometries, two materials, two shapes interact: to the great stone volume and to the magnificence of the vertical arches passed down to us through the centuries, the museum answers by its light and luminous presence, its contemporary and fluid architecture, creating a diaphanous response composed of horizontal drapery that seems to float over the site and its archaeological garden. 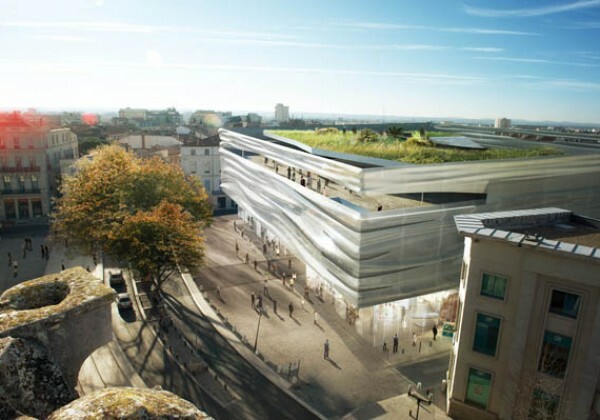 With the Court of Justice facing the project, it is a new vision of the place du parvis and of the arc described by the Roman arenas that the building is putting into perspective: its lightness responding to the classical massive volume, thus creating a respectful and exceptional dialogue. 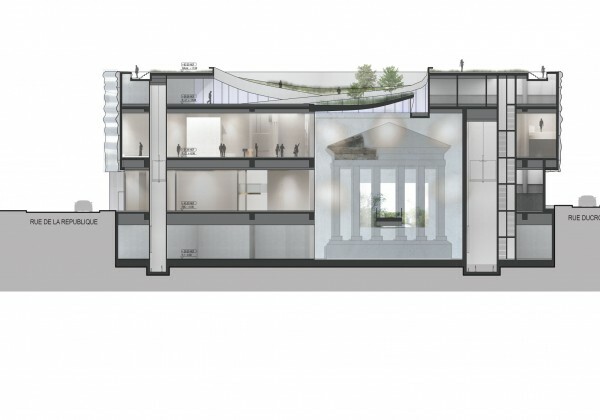 Emerging from the archaeological remains, the Museum is designed as the gate of an urban promenade: the urban planning and the mise en scène of the perspective give value to the treasures of the roman heritage (the Arenas, the remains, the pediment of the “Source”) and the more recent heritage of the modern architecture. The archaeological garden, which has been designed by landscaper Régis Guignard from Société Méristème, is meant to be didactical. A series of overlaid botanical strata corresponding to the pre-Roman, Roman and post-Roman periods, match exactly the museography themes. Geological remains underneath the ground remind us of all the different layers of the civilizations that preceded us. 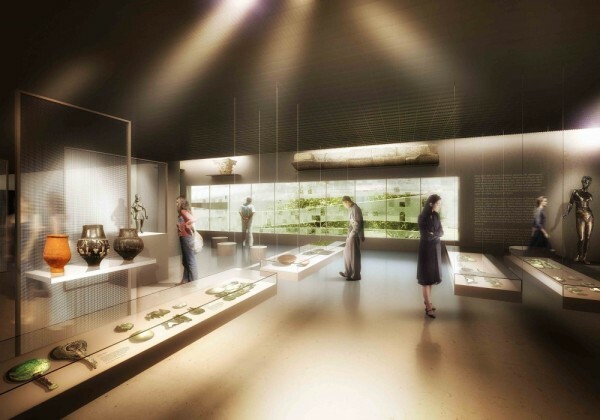 The future vegetation that will be part of the palette will be selected and disposed into strata, following the three historical part link to Nemausus-la-Romaine and presented for the first time in the Museum. Its attracting aspects will be reinforced by different urban conviviality areas. Located on the gate of the old city, the museum reveals the Arenas from the Republique Street through its transparent ground floor: announcing the event, it attracts and surprises. 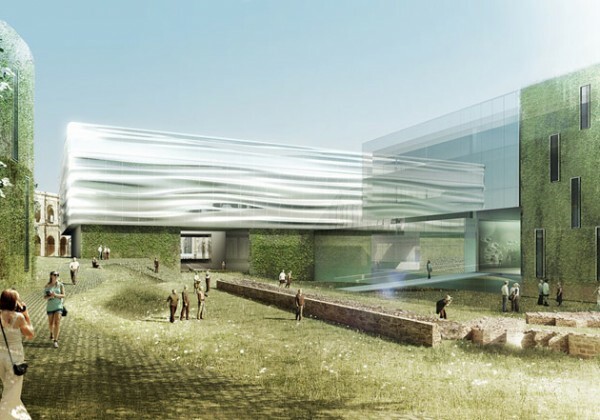 The Museum, located on the edge of the ancient Roman wall, was designed so as to generate a strong coherence in the city, the inventive museography within it and the archeological garden that extends it. Between the entrance hall and the café, a wide interior street, accessible passage even when the museum is closed to the public, connects the parvis to the archaeological garden following the Roman remains. This semi public passage creates a visual opening and an access to the archaeological garden, attracting the pedestrians and revealing a roman axis, a link between the remains and the Arenas. The current archaeological museum of Nîmes collections count more than 25 000 items, such as the mosaics of Achilles and Penthea, discovered during the archaeological excavations of the Allées Jean Jaurès site, this exceptional remains were never been presented to the public due to the lack of space of the existing museum. 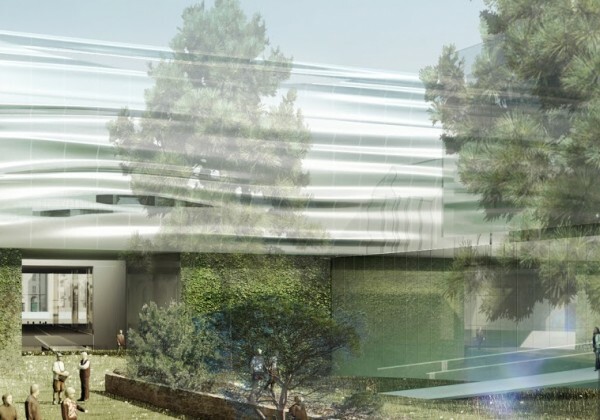 One of the ambitions of the new museum will be to be highly attractive, by the subtlety of its constructive system, of its light facade but also by its museographic tour, its technical innovations and aesthetic aspects, its videos projections and installations. 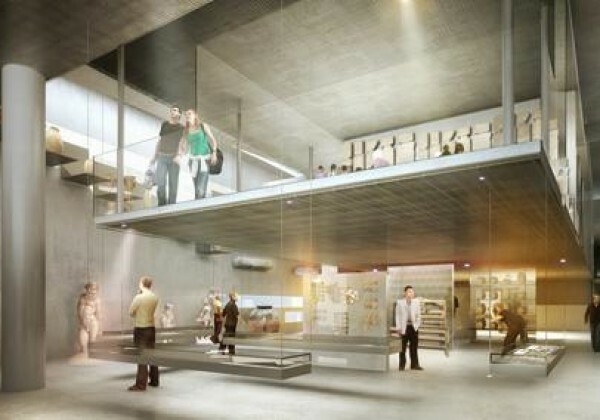 The Museum offers ascending promenade. This ascension begins from the main hall, the visitor is aspired by the generous curves of the “Chambord” stairs. The visit continues within these scissors stairs by a series of ramps that procures higher viewpoints on the collections. Wide windows open the inside space to the garden and to the Arenas. The rooftop and its terrace mark the last step of this tour, offering an outstanding panorama on over twenty centuries of Nîmes History.